From Disneyland to movie star footprints, Koreatown to the Mexican enclave at Olvera Street, here’s a look at the must-sees in Los Angeles, California. The City of Angels is truly one of our favorite family destinations — fun, exciting, cultural, sunny and beachy at the same time. While it’s struggling to conquer environmental issues with a recently released mass transit light rail and more public buses, however, most families will want a car to get around. Note that Hollywood is a participant in the CityPASS Program which includes admission to many popular attractions for one discounted price. For general information on the Los Angeles Area, contact the Los Angeles Convention and Visitors Bureau at 800/228-2452. This museum is jam packed with activities, a Dinosaur Hall, and exhibitions for everybody including a 65-foot fin whale seen in a glass pavilion. A good place to start with little kids is the Parsons Discovery Center, where they can investigate giant stuffed polar bear teeth and snake x-rays with the use of microscopes, magnifying glasses and binoculars. Tree-hugging kids will enjoy their 3.5-acre Nature Gardens and interactive Nature Lab, as well as Sustainable Sundays programs. The museum features Critter Club for 3 to 5’s and Junior Scientists for 6 to-9s; admission is free for under-5s. With 33 million objects, there is enough to see for a week’s worth of museum trips, so pick and choose what you want to view before you wander around. A great museum devoted to all sorts of rare, antique, flashy and otherwise famous cars. Check out The Beverly Hillbillies‘ Old Jalopy, the flying DeLoreon from Back To The Future, and lots of beautifully restored classics now, as the museum is deaccessioning some of its priceless automobiles to fund a new expansion. In addition to more and better organized display space, the Petersen’s building will be reskinned with a molten chrome facade that will make it look like a concept car. The Discover Center is a great place for kid-centered learning about automobile technology, and it also offers a Discovery Hour and special Story Time. An extensive schedule of kids programs are all complimentary with admission; check on exactly what’s happening and when before you go. Closed Monday, under 5 free. 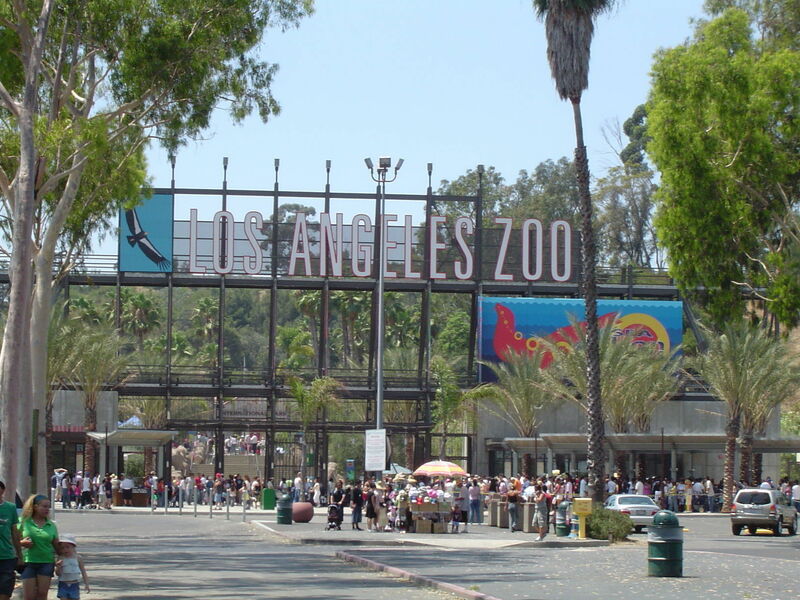 Home to over 1,100 animals and 250 different species including amphibians, birds, invertebrates, mammals, reptiles, plus a botanical garden, this “cageless” zoo is located in the beautiful Griffith Park. It is a favorite of LA residents and tourists. Special tours include the Indian Rhino Encounter, the Elephant Training Demonstration, Campo Gorilla Reserve, Elephants of Asia, and the California Condor Rescue Zone. Muriel’s Ranch is a petting and grooming zoo, and kids can also enjoy the Neil Papiano Play Park and the Tom Mankiewicz Conservation Carousel. Thanks to grandma Carol Martinez for turning us onto Noah’s Ark, a remarkably innovative playspace at this Jewish cultural center in western LA, convenient to families staying in Beverly Hills, Westwood or Santa Monica. Noah’s Ark is a large wooden structure, inspired by the ancient flood story, filled with animals and diverse creatures made of recycled materials, where kids (and adults!) work, climb, build and connect together. Kids must be accompanied by an adult, and adults can only bring in four kids each, as close supervision is requested. This place is so popular that there are timed-entry tickets; it’s free to all visitors on Thursday. Visit mid-week after lunch if you want to see where Westside parents spend their free time. As for lunch, there is said to be a super Kosher restaurant. Kidspace’s mission is to promote education and enrich the lives of children, families and the community; its Pasadena location makes it most convenient to families staying in downtown LA. Almost all exhibits are hands on, and thrilling for those who can’t wait to touch everything. A great place for kids under 4 to learn, grow and have fun, The Early Childhood Learning Center section of the museum is the spot created with your Tiny Travelers in mind. Additionally, outdoor play areas include the Kirby Kids Corner for toddlers, plus climbing and water play areas, and a performace space. Special events are frequent, so call ahead for schedules. With the goal to help kids make a positive impact on their communities by “playing our way to a better world,” this baby-centric museum offers special focus on VIBs (Very Important Babies) with the VIB Lounge, a safe place for infant and toddler explorers, and VIB Hour (Wednesdays at 9am) when the entire museum is turned over to tots under-2 (and their caregivers). Special classes such as Sensation City, crEATe and Tiny Talkers are offered for this youngest age group. The Zimmer is in inside an office building in the Miracle Mile part of central LA, near Farmer’s Market and the LA County Museum of Art. Check their site for schedules. Los Angeles’ premier science museum caters to young children with hands-on presentations, like “Science in Toyland,” and specially focused Discovery Rooms for children age 7 and under. The NASA space shuttle Endeavour dominates a hangar and a fascinating exhibit. School kids will thrive on the Creative World area, World of Life, Air and Space, and the Ecology exhibits. The Center features a number of special exhibits that come and go, and an IMAX theater that runs a selection of films daily. Spend the afternoon rollerblading or biking along the beach’s 27-mile concrete pathway. Your teens will love the hipness of the atmosphere, the sunshine and the safe, protected, car-free zone. Ask your hotel concierge where to rent skates — or bikes if you prefer. There are several vendors near the Santa Monica Pier and up and down the boardwalk, offering all size bikes, baby trailers and helmets for all. Window shop on the main street of Beverly Hills, a posh neighborhood where high rent, high-priced shops display only the height of current fashion. Famous designers have their stores here, the celebs all shop here, and it’s fun to peer beyond the windows and look around. Park your car and stroll down Hollywood’s main thoroughfare for new, used, trendy, Eurotrash and new wave style. There’s something for everyone in all price ranges. It’s black and oozing, with occasional puffs of smoke and odor. Watch paleontologists at work at this world-famous archeological site, where dozens of amazing prehistoric skeletons have been discovered. See saber-toothed cats, mammoths and other Ice Age fossils at the museum, which also features special exhibits. Just getting to the Getty is lots of fun. Your family will ride in a tram almost a mile up Getty Center Drive to the arrival plaza, catching glimpses of Century City, downtown Los Angeles, Westwood and UCLA en route. 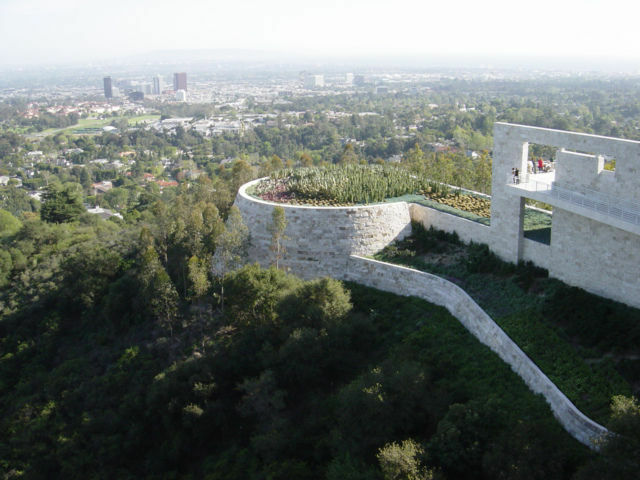 Although the Getty art collection has its detractors, the museum architecture itself is worth a visit: five two-story pavilions, designed around an open central courtyard and a waterfall cascading along the left side of the grand stairway, are stunning. Beautiful gardens and terraces beckon you to lounge and relax. Home to an enormous variety of European paintings, drawings, sculpture, illuminated manuscripts, decorative arts, and European and American photographs, there are also interesting traveling exhibitions and regularly scheduled lectures and events for all ages. If traveling with preschoolers, don’t miss their art classes for kids, their kid-focused GettyGuide audio tour, family-only events, weekly concerts and special Famly Room Gallery for hands-on arts appreciation. Entrance to the museum and grounds are free of charge, but there is a fee for parking your car before you board the tram. The Dolby Theatre (formerly Kodak Theatre) is the home of the Academy Awards Ceremonies. It’s not nearly as glamorous as other past homes of the awards, but starstruck kids and parents will enjoy the 30-minute tour during which you will see an actual Oscar and images from Academy Awards ceremonies. Make sure to watch your feet, as this part of Hollywood Boulevard boasts the Walk of Fame with some of the star-encrusted sidewalks the city is famous for. There are many companies that offer tours of the stars’ homes, but these folks celebrated their 75th aniversary in 2010 — and they’re still in business. Even though you many not see a whole lot aside from tall fences and thick rows of trees, just listening to the witty guides’ gossip and driving around in these beautiful neighborhoods of West L.A. , Hollywood, Bel Air and Beverly Hills will provide two hours of fun for the family. These tours depart from Grauman’s Chinese Theatre and also have pick-up and drop-off at most hotels. A landmark dating back to 1934, this covered marketplace chock full of 120 produce stalls, fast food counters, and gourmet eateries is an irresistable slice of the past. Even if you’re not hungry, peek into the famous Littlejohn’s English Toffee and fudge shop, Du-par’s breakfast restaurant, la Loteria taco stand, Light My Fire hot sauce boutique or Zia Valentina gluten-free bakery. It’s grown since a dozen farmer’s parked their trucks on empty land and is now a place you can get your hair cut or repair your cellphone. The Famer’s Market is truly fun for all ages because you can snack, souvenir shop, pause at their outdoor cafe tables, browse at Taschen Books, watch the locals market for evening supper — and entry is free. Open daily; check their website for a schedule of Summer Sunday kids’ events and free year-round activities. Next door is The Grove, one of LA”s newer and very busy lifestyle malls with lots of free entertainment. This architectural folly, a collection of 17 separate tile, glass and porcelain covered, wire-wrapped steel sculptures that rise to 100 feet, illuminates the neighborhood surrounding the USC campus in Watts. Completed in 1955 by Italian immigrant Simon Rodia after more than 30 years of dedication and labor, they are pure whimsy (or madness) and a delight for all ages. Built as a tribute to the United States, they are one of 4 National Historic Landmarks in Los Angeles and one of 9 examples of folk art on the National Register of Historic Places. This outdoor attraction boasts its own arts center with tours, lectures, changing exhibits and an annual September Jazz Festival. There are a number of bustling beaches that stretch for miles along the beautiful Pacific Ocean. Santa Monica Beach, with the famous pier that stretches out into the sea, is a great place for lounging in the sun and taking in the Southern California scene. The pier hosts Pacific Park/strong, a carousel and amusement park rides, there’s fishing and dining and lots to see. The area is flooded with trendy boutiques for those who are looking for some shopping time. Throughout the year, concerts and special events take place on the pier — check for details. It seems that no visit to LA would be complete without a glimpse of the sign which advertised a 1920’s real estate development and now defines an industry. Stand on Hollywood Boulevard and look north into the hills. You should be able to see the 50-foot letters on top of Mt. Lee, fitted with thousands of light bulbs for evening. Built on the site of the original El Pueblo de Los Angeles, this vibrant marketplace welcomes visitors with Mexican restaurants, shops, and bodegas. Stroll around and admire the Old World Spanish architecture, and after an afternoon of shopping and strolling, stop to taste the excellent Mexican cuisine. Fiestas and celebrations go on throughout the year marking Mexican and Latino culture and traditions. MOCA’s extensive collection includes American and European works created since 1940. Bring the kids to see the colorful artwork of Jackson Pollock, Jasper Johns, Roy Lichtenstein, Mark Rothko and other masters of contemporary art, along with the impressive work of emerging artists. Celebrating its 25th anniversary in 2013, the Autry National Center (previously the Autry Museum of Western Heritage) is essentially a history musum dedicated to the exploration and sharing of stories and experiences of the diverse people of the American Southwest, from indigenous people to European American setters. The museum is home to 500,000 artworks and artifacts dedicated to this history and culture. There are kid’s programs with art workshops, storytelling and hands-on activities. 9400 Culver Blvd near Washington Blvd. The low rents in the Culver City neighborhood south of Beverly Hills have spawned a thriving arts scene, and today it is one of LA’s trendiest areas to shop, dine and simple walk around. Start your visit at the Culver Hotel, which opened in 1924 to house many cast members making films at the MGM Studios nearby. (Their display windows and lobby have some memorabilia.) Once the Ince/Triangle Studio, MGM is now Sony Pictures Studios, and you can tour their lot and recall the days when “The Wizard of Oz” and other greats were filmed, as well as see where the Spider-Man movies are done. Top Culver City restaurants and bars include Akasha, City Tavern and Rush, all farm-to-table style eateries with cafes, largely organic kitchens and a local brew pub scene. The Tuesday Farmer’s Market is a big scene. The Kirk Douglas Theatre is a small venue for offbeat live theatre, and more than 30 art galleries are along Washington where it meets La Cienega. At Washington and National you can try out the Metro Light Rail train and take it downtown or into Hollywood. Able to speak for itself, the original Disney theme park is still one of the most popular family vacation destinations in the United States. Coloful Disneyland and the more ride-oriented California Adventure park are located about 90 minutes from downtown L.A. Read more about it in The New Disneyland Resort – Not Your Parent’s Disneyland, and plan to stay two days if you can. A great movie-themed amusement park and working motion picture studio in one. Get a behind-the-scenes look at movie making, hop on thrilling wet and dry rides, and stroll down famous “Hollywood” street scenes. With older kids or lots of stamina, you can make it a day and night outing at CityWalk, Universal’s hopping evening mall of outdoor cafes, shops and music clubs. In summer, some of the museums offer nighttime activities and special programs. Check their websites for the most up-to-date information. The Getty offers drawing classes in the garden on certain days, and the Museum of Contemporary Art has a weekend evening program called MOCA After Dark with collection tours, a DJ, music videos, and art projects — perfect for teens. Hi. Just wanted you to know that the Hollywood Wax Museum is still part of CityPass and will remain in the book. When you use your CityPass ticket, you will be able to visit the Hollywood Wax Museum AND the Guinness World Records Museum across the street. Both attractions are great for families. Enjoy!